4.5 out of 5 based on 18 bloggers and 5 commenters. 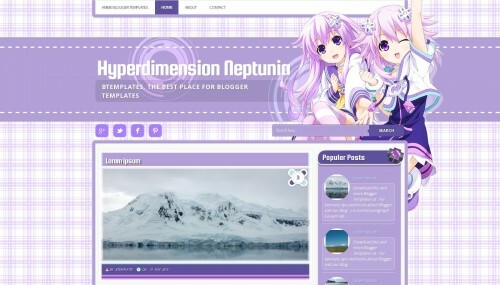 Hyperdimension Neptunia is a free premium blogger template with 2 columns, magazine-styled, right sidebar, an exclusive design for Blogger, social bookmarking icons, posts thumbnails, breadcrumbs, a background pattern, related posts support, well designed threaded comments, girly looking, geometric motifs and 3D effect. Excellent template for blogs about anime, art, crafts, games, internet or software. how could I add more menu next to home menu? I was already confusing b’coz i’m not an IT student and I have already put my effort by testing some codes many times and it won’t work. Thank you and please advice.